How do you rotate your WP7 pages/change orientation? I love to see apps which support orientation changes, but how do you do it? Better yet, how do you do it ALL in XAML? I have some code and XAML to start you off. Heard about the new Nokia Lumia Windows Phones? Lets Compare them (and the Samsung phones too). 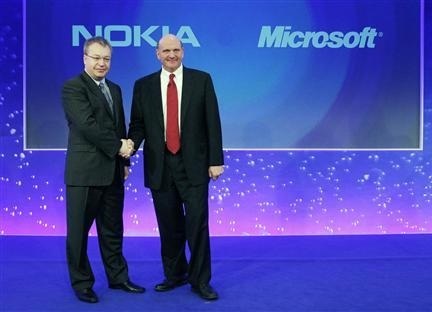 Last year we heard about Nokia coming on board for Windows Phone 7, lets look at the first fruits of their labours. We're going to compare the currenly popular Apple iPhone 4S, Samsung Focus and the three new Nokia Lumia phones. How Do You Reinstall ALL Your Old Windows Phone Apps On A New Phone? Have you had to replace your WP7 for some reason? Have you had to do a HARD reset on it? Wonder how you get all your old apps, even then ones you paid for, reinstalled? I have a solution! Nokia Helping You Advertise Your WP7 Apps! Think you could use a hand with some WP7 branding and advertising? Nokia wants to help you! Hey Apple, Exactly How Many IS Enough For A Rating Average? I saw an article talking about Air Canada’s iPhone app, so I went to check it out. Maybe Apple’s using “new Math” but……? Do You Program Windows Get Reset When You Clean Your Keyboard? Do you keep your keyboard clean with Lysol Wipes? After you go back to work, do you find all your window locations reset? I can help you! Having Problems Updating NuGet VS Extension? Are you using the NuGet Visual Studio Extension and getting errors when you try to update it? I think I can help you! The ODNC is doing another WP7 study group starting in March, but first, there’s an information session Feb 14th 21st to help you figure out if this is for you! Are you constantly asked for your TFS creds? Tired of it? Heres the solution! If you’re new to TFS/Team Explorer and you’re getting sick’n’tired of having to enter in your username password, try this solution out! This is a call for any and all technical speakers in the Ottawa/National Capital area interested in presenting at the upcoming Ottawa IT Camp 2012! Ottawa IT Camp, the best and FREE technical conference announced their dates for their 5th year anniversary! Image banding is not pretty, especially on YOUR brand new and cool app! So why let it happen? I show you an EASY fix! Asterisks in WP7 Assembly Version Revision? WATCH OUT! They go missing! One cool feature in Visual Studio is to setup an Assembly Version with an asterisk, but if you use this, you’ll need to read on! It goes MIA if you’re not careful! My ListBox items WILL NOT stretch to maximum widths? WHY NOT?! Are you trying to make your items in your ListBox stretch out to the maximum width of your container? And it’s JUST NOT WORKING for you? I have two things you might try (and hopefully one will work). DevTeach Ottawa 2011 Pre-Con, Great day of Silverlight! Today I was lucky enough to participate in DevTeach’s Silverlight Pre-Con, and MAN was it GREAT! Read on for a summary! I just released my latest WP7 app for an upcoming conference in Ottawa! Read on for more details. Can you change the WP7 ApplicationBar background? YES! Are you making a WP7 application? COOL! Want to change the background, read on for the quick'n'dirty for how! Did you get an email recently from TortoiseSVN telling you about the great new 1.7 version? If you like your icon overlays and using Win 7 x64, you might want to stick with 1.6.16. WP7.5 Mango installed, what do I think after 24h? I've lived with Mango for a grand total of 24h, now that? Read on for my first impressions!